Estremadura is one of Portugal’s less well-known wine regions, and understandably so. This fertile land north of Lisbon has plenty of vineyards, but they have long been the source for fairly undistinguished bulk wines. But change is afoot, not least a whole new name for the wine region, which is to be re-christened ‘Lisboa’ as its appellation. Several smaller estates are planting noble varieties and making much more serious wines, and some believe that Lisboa has a real future as a very high quality wine region. Already making a name for itself is Quinta de Chocapalha (shock-a-pall-yho), a family-owned estate whose wines are made by daughter of owners Alice and Paulo Tavares, Sandra Tavares (right). Sandra is one of Portugal’s hottest winemaking properties, both here at Chocapalha, and in the Douro where she and husband Jorge Borges run an estate called Pintas (Jorge is ex-winemaker for Neipoort and Quinta do Passadouro). At Chocapalha, Sandra used robotic lagars and all French oak in a meticullous operation that has taken the wines of Lisboa to new heights. Both indigenous and international grapes are planted. For reds these include Tinta Roriz, Touriga Nacional, Castelão, Cabernet Sauvignon and Syrah, whilst for white wines Chardonnay is blended with Arinto, Viosinho and Vital. The wines are decidedly modern in style, but are very carefully made and marked by a noteable power, married to harmony and balance throughout the range. Corney & Barrow are UK Agents for Quinta de Chocapalha, but supplies are limited and stocks sell quickly. See current availability at www.corneyandbarrow.com. 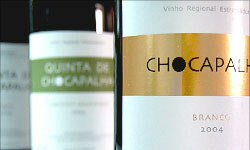 See all stockists of Quinta de Chocapalha on wine-searcher.com. This 2005 has an extra year in bottle under its belt, and whilst the winemaking is identical, there is no mention of Syrah on the back label this time. It has a very fragrant nose again, with tobacco and spices, and that little kirsch-like, floral lift to the black fruits. On the palate perhaps just lacks a touch of the glossy plushness on the mid-palate, but that’s a small complaint as that same classy structure and vitality comes through, and the fruit is balanced into the long, sweet-fruited finish. 91/100. £17.49 from Corney & Barrow See all stockists of Quinta de Chocapalha on wine-searcher.com.